Stockholm - After selling out shows across Europe last year, Travis Pastrana's Nitro Circus Live is back on tour — beginning at the brand new 40,000 capacity Tele2 Arena in Stockholm. 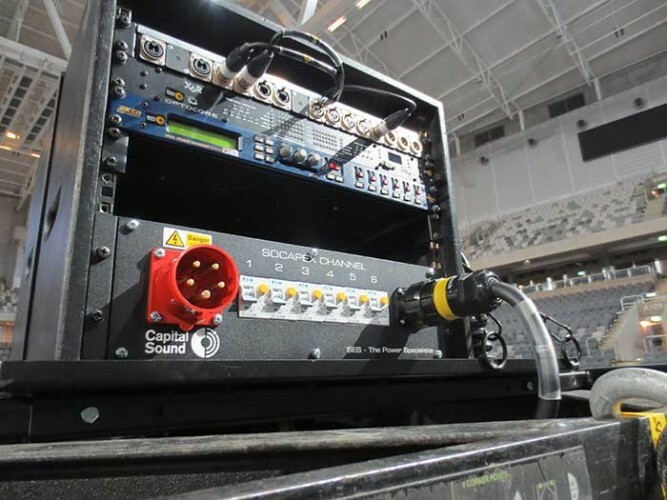 Capital Sound provided the sonic backdrop, including their Optocore X6R-FX interface rack, as some of the world’s hottest and best extreme sports stars of freestyle motocross, BMX and skate took part. The show also featured tricks and stunts on the 15ft high Nitro ‘Gigant-A-Ramp’ where skis, tricycles, skateboards, freezers and boogie board stunts were featured. However, the state-of-the-art football stadium, with its retractable roof, proved to be a challenge for the sound crew to achieve flexible pattern control and retain sightlines. Capital project manager, Paul Timmins, fulfilled a design that was deliberately rigged off-centre towards the corner (for the stadium shows), to optimise the impact for the spectators. "Here we were able to provide sound reinforcement over a 270° angle, because of the unusual way in which the seats work, whereas when we move to arenas this will be a full 360° of audio." But Capital are fully aware of all the challenges embedded in this unusual event, having worked on the European tour last year, meeting the request by long-serving sound designer and engineer, George Gorga for an advanced 2-zone fibre distribution solution, for both flexibility and a superior signal path. The X6R-FX converter offers the highest degree of flexibility concerning the I/O configuration. Six different card types enable customisation of the card slots on the rear of the device; the conversion of analogue signals — 16 inputs, 16 outputs, 8 inputs and 8 outputs or dual microphone inputs with two independent adjustable preamps — to AES/EBU is provided as well as the sample rate conversion for AES/EBU. This provided Capital Sound with all the flexibility they needed. "The idea is to build the six [loudspeaker] hangs of [Meyer Sound] Milo and Mica clear of anything that’s going on as we only have a six hour window to get it up in the air," he explains. Each self-powered Milo hang had been customised. "With the show being in the base of the venue, the cable routing, power distro and any amps that might be sited on the ground would ordinarily get in the way. The tour uses eight hangs of PA in two areas of the building picking up local power which is possible by using the fibre signal distribution. "We effectively break up the distro, giving each hang its own dedicated power distribution and an Optocore device. So we can put any hang in any position within the building, interlinked by the Optocore system." This approach, using Optocore, was essential to a design configured back in August. "We looked at the conventional way of distributing the power and signal on the Meyer self-powered system — with a left and right distro rack that would then feed the power to all cabinets via a long, fairly heavy Socapex power cable, giving all cabinets their own home run signal feeds. However, that cable is chunky and we wanted to avoid that here. We also wanted to have an element of speed hence the Optocore." The stacks of cabinets are already pre-cabled and on dollies — and the rack on the top has a 32 amp 3 phase in, which then distributes into the Socapex that feed 12 ways of power. An XTA DP226 and Optocore XR6 deal with the input to all the cabinets, driven by a 150m-200m long fibre that runs between each of the arrays. "Therefore, we can split the arrays up, and if we want to hang them huge distances apart we can do that by picking up local power in the venues." He explains that the Optocore X6R rack has now become the standard package for Capital Sound’s larger events. The company first purchased eight of these interfaces for Take That’s 2011 Progress Live tour before adding another six for deployment on the high profile British Summertime Festival in London’s Hyde Park in July. Both audio tech and crew chief Kevin Smith and system tech Mike Savage Nachamin were impressed with the Optocore deployment. The former confirmed, "By having two X6Rs at FOH for distro, and running fibre to the other X6Rs on top of each pack, we could move the hangs around if we needed to. From those X6Rs, split into two zones from a Lake processor, we run two audio feeds on AES into each hang, before passing into the DP226 to act as an AES to analogue converter." Paul Timmins says that issues of set-up time were as important as sonic excellence. 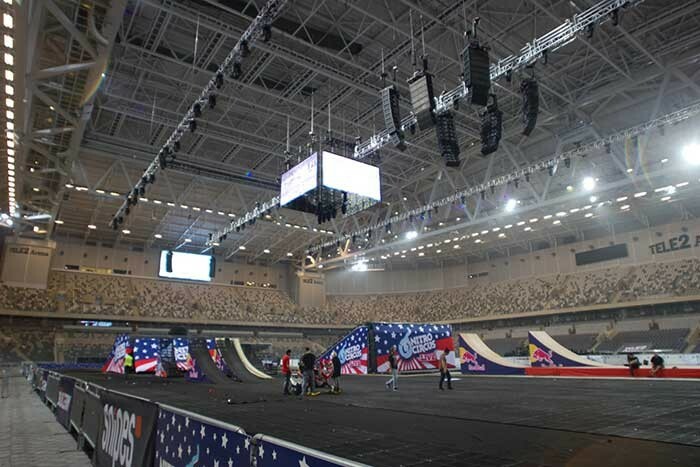 "Both for ourselves and for George [Gorga] our goal was to achieve great audio, but this project is also about speed, so that the actual mechanics of the show — ramps, matting, etc — can go in and the system has been designed with that in mind." He believes this elegant design provides both flexibility and high visibility. enabling the ramps to be moved around and the hangs to be extended with minimum hassle. "Having just two cables running to each hang is a great advantage in an environment where sightlines are paramount, and the hangs need to be trimmed high to avoid getting in the way of the bikes."